As week one of The Rubbish Diet continues I thought I’d share the bin set up in our kitchen. 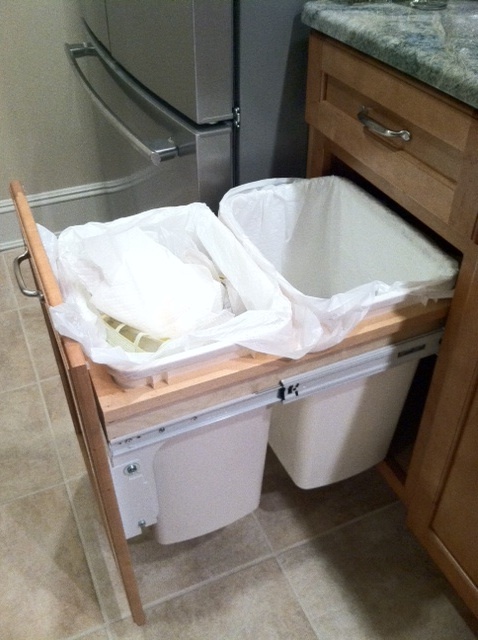 For our trash we have one of those trendy pull out cabinet things with two 41-qt bins. The front bin is for trash. The back one is for glass, metal, and plastic. Right now the trash is getting a bit full. There’s some food packaging, the ever present paper towels, coffee k-cups, and some plastic bags and plastic wrap from some organizing I did over the weekend. There’s also a gigantic cat food bag that is taking up most of the space (we go through one every few months). The glass, metal, plastic bin has a milk carton and some tin cans in it right now. 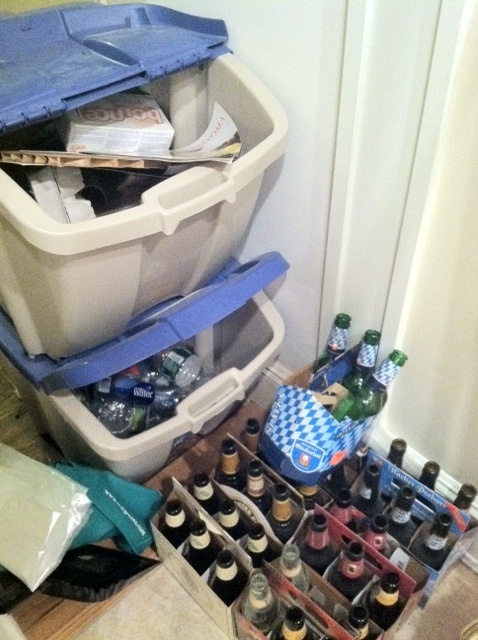 The other pic is our not-so-attractive recyclables and redeemables area. The top container is for mixed paper. It has some paper board, catalogues, egg carton, and random bits and pieces of paper. We put out a big bag full of paper and cardboard last week and will likely not do so again until next week. The bottom container is for redeemable water and soda bottles. We rarely buy soda or bottled water. As you can see, beer is a different story. This is about a couple of months worth of redeemables. New York State has a returnable container law also known as the “bottle bill” which applies to “carbonated soft drinks, water, soda water, beer, malt beverages, and wine cooler containers under 1-gallon” (juice and sports drinks don’t count). Every time you purchase these items you’re making a ‘deposit’ of 5-cents per bottle. Stores that sell these items have to give you your deposit back if you bring back the empties, but only the empties of the things they sell. The thing is, the people usually bringing back empties are urban scavengers trying to scrape a few bucks together. Not quite what the law makers had in mind when they were trying to reduce litter and increase recovery of these containers. In any case, we take our redeemable containers back for a little cash, which we typically just put towards our next beer purchase. So there you have it. One trash bin, one for glass metal plastic, a larger container for paper and one bin plus floor space for redeemables. This entry was posted in The Rubbish Diet and tagged Recycling, redeemables, The Rubbish Diet. Bookmark the permalink. Just wondering about a composting bin. Do you plan on having one when the spring comes and having one becomes more realistic? Pete – yes, composting is likely in my future. I have to figure that out first. Luckily there are a lot of resources for backyard composting, just got to start doing my research and get going diverting those food scraps!